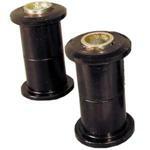 We always recommend replacing the old rubber bushings with our new polyurethane ones. Many times, rear end shaking is due to worn-out bushings. If your Bronco is still running 30 year old rubber bushings, it's time to change 'em. 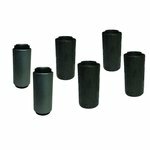 Our polyurethane bushings are black graphite impregnated for quiet operation. How often do you need to replace polyurethane bushings? You may never need to change them but they should be checked from time to time. Cracking can be caused by over-tightening and four wheeling. If you see cracking, they should be replaced before they fall out. 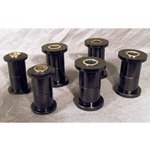 We offer our black graphite impregnated urethane and stock style rubber spring and shackle bushings. If you are doing a "stock" restore or you want to add all the flexibility you can get, then you will want to use the rubber bushings. Otherwise, our urethane bushings have centering ridges on the outside surface which will do a better job of keeping the spring centered in the spring hangers. 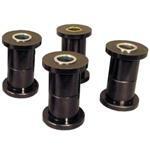 We include urethane bushings as a standard part in our suspension kits. 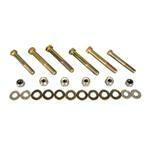 Rubber Spring and Shackle Kit For stock rear leafs only!